4" VISE JAWS that work on any Metal Vise. Protect your working piece Flat or Round from the Metal on your Vise. They Will not Discolour or leave any marks on your Working piece, with 8 strong rear earth magnets per set, they will stay put on your metal vise. 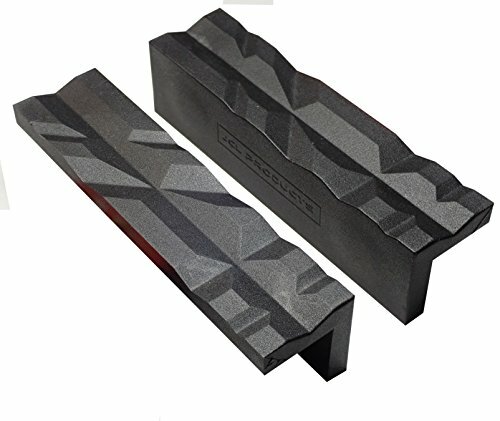 The Unique Multipurpose DESIGN allows you to TURN them OVER for use on the Flat or Grooved side. What you can expect from our NYLON VISE JAWS. Complete satisfaction and Knowledge That this product will last a life time and you will never have to buy another. We pride ourselves in research and test our products to provide a quality Tool from the best available materials. Certification complies with requirements of relevant USA standards. KIU products are backed by a Full 100% Replacement or Money Back Guarantee. For The BEST quality Multipurpose VISE JAWS click the Add to Cart button at the top of this page. If you have any questions about this product by JCL PRODUCTS, contact us by completing and submitting the form below. If you are looking for a specif part number, please include it with your message.